Ever since Samsung announced the Galaxy S6 and Galaxy S6 Edge people have been trying to put it against other flagship smartphones and each benchmark anyone thrown at these devices showed off the charts results. The reason these two smartphones are so good in benchmarks could be the fact that they include new chipset and memory technology. We have already reported about Samsung's Exyno 7420 chipset which is made using 14nm manufacture process. Samsung confirmed the Qualcomm Snapdragon 810 wasn't good enough for its Galaxy S6 flagship smartphone and that was most likely related to performance, but also on consumption. The in-house developed has both better performance and lower consumption, so we could say that Samsung took the right decision seeing that Qualcomm's Snapdragon 810 has lower results in benchmarks. Could Samsung's Exynos chipset may have been rigged to show higher result in benchmarks? Maybe, but we will only find out when the smartphone goes in the hands of reviewers. Until then, we can only rely on the information we get from these pre-release units that have been showcased at Mobile World Congress 2015. The folks over at PhoneArena have been able to test the Galaxy S6 and Galaxy S6 Edge and the results are not short of impressive. For those who don't know the Galaxy S6 and Galaxy S6 Edge are packed with 3GB LPDDR4 RAM with UFS 2.0 technology, which hasn't been embedded in any other smartphone until now. This seems to make both Galaxy S6 extremely fast at reading and writing information from the smartphone. Transfer speeds are off the charts as well. 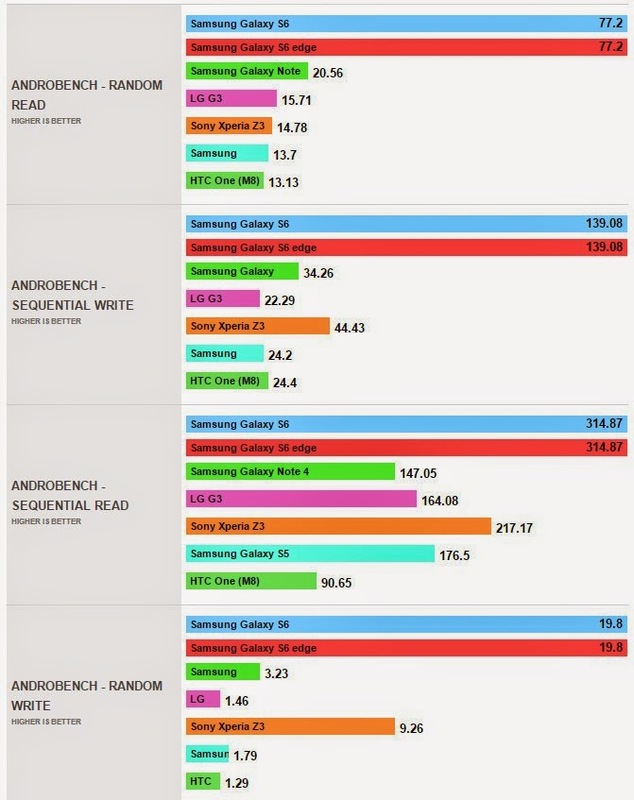 In fact, AndroBench shows that Galaxy S6 and Galaxy S6 Edge have the fastest RAM modules by far. It will be interesting to see which smartphone will be able to compete with Samsung's Galaxy S6 in the coming months since most of the hardware inside developed by the South-Korean company in-house.